Handicrafts are an integral part of the lives of Gujarati people. One can see the reflection of Gujarat's diversity through its art and crafts collection. Each and every district of Gujarat specialises in a different art form. Handicrafts of Gujarat are a beautiful amalgamation of stitches, colours, patterns and embroidery. From colourful tie-dye to sophisticated wooden antiques, there is no dearth of opulent handicrafts options in Gujarat. People who are having a keen interest in Handicrafts should take a tour to the Gujarat. Embroideries amongst the art and craft section of Gujarat stand apart. Embroidery type like 'Patola', 'Rabari', 'Mutwa' and 'soof' are the pride of Gujarat. Each and every item is made to perfection by the renowned artisans and craftsmen of Gujarat. Traditional artisans in tribal areas dye, weave, embroider and print some of the Gujarat's finest textiles. Warli Painting, Rabari Embroidery, Pithora Paintings, and Rogan Painting are the exquisite works made by the tribes of Gujarat. Gujarat is famous for its classy thread work. 'Zari' industry based in Surat and 'Kathi' embroidery of Kutch are the best examples of thread works. Bandhani or Bandhej is another famous speciality of Gujarat. This basic tie-dye work is available in various textiles like cotton, georgette, and chiffon. Bandhani have found maximum application in sarees, salwars, kurtas, and other forms of dress materials. Nothing can beat the quality of leather that one can find in Gujarat. 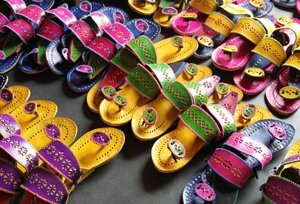 Items made of leather that are famous in Gujarat are footwear, purses, batwas, mirror frames and many other articles. The designs carved meticulously on various handcrafted items bear a powerful imprint of the old tradition. There's something special about handicrafts of Gujarat, they are expressive, unique and beautiful. Listed below are some beautiful art and crafts forms of Gujarat that have flourished far and wide up to the western quarters. 2 - Beadwork Beadwork, an art or craft form of Gujarat is created by joining 2-3 beads together. Gujarat specialises in the art of beadwork on clothes as it enhances its appeal. Beads are used to create hanging chaklas, Indhonis, Mangal kalash, nariyal, artefacts, necklaces, bangles, earrings, ornaments, motifs, patterns and torans. Most native beadwork is created by the tribal community of Dahod, Vadodara and Panchmahals regions. 3 - Patola Patola, a double ikat (dyeing technique used to pattern textiles) woven saree made of silk, is one of the finest hand-woven saree produced in Gujarat. In this unique tie-dye technique, one can see identical patterns on both the sides of the fabric. 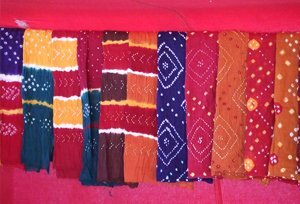 There are primarily four patterns of Patola saree and all are created in Gujarat by the Salvi community. 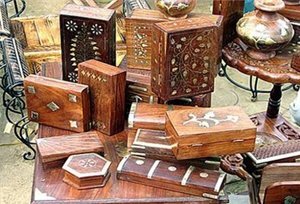 4 - Woodwork From small handicrafts to furniture, in Gujarat one can see some of the best specimens of traditional wood work. Woodwork and furniture from Surat, Kutchh and Saurashtra; Minakari furniture from Rajkot and Sankheda furniture are simply the best. In Gujarat, one can find hand-carved exotic wood furniture of every style. Even inlay work using coloured wood, horns and even commercially viable options like plastic are used in artifacts, wooden plaques. 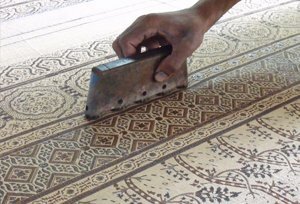 6 - Hand Block Printing Gujarat, the oldest block printing centre in the world, is still the major producer of block prints. Twinkling stars in the clear sky, Egyptian tombs, patterns of abstracts and dense forest with beautiful colour combination are amongst the known block printing patterns. 7 - Embroidery Work Embroidery work of Gujarat turns out to be the top on the shopping list of every tourist who are visiting the state. Embroidery designs in Gujarat are as diverse as the religions followed and languages spoken in the state. The unique combination of pattern, stitches, thread, shapes and colour makes one embroidery looks apart from the other. 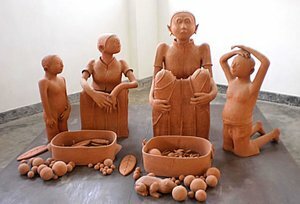 8 - Clay and Teracotta Work Figures and toys made of clay and terracotta are an essential part of Indian pottery. Gujarati Dangi tribes pray and worship their own clay god. Clay figures and toys like horses, cows, bulls, and buffaloes are like the watermark of Gujarati art style. Contemporary Mud work is the other name given to the clay craft of Gujarat. 9 - Leather Work Tourists who are on a shopping spree to Gujarat shouldn't forget to purchase the vulnerable leather products. In Gujarat, one can find excellent items made of leather like mirror frames, batwa, frames, mojdi, cushion covers, bags and purses. All the leather products in Gujarat are embellished with embroidery, bright tassels and mirror work. Leather objects are mostly made by the people of Meghwal community. 10 - Applique and Patch work Applique is one of the oldest and unique forms of Gujarat's craft that is created by different patches and patterns. Multiple patterns together create a jigsaw that makes the fabric look more attractive and vibrant. One can see this graceful form of art quilts, wall hangings, household products and apparels. Patchwork in vivid colors, using scrap and waste material is done by Bharwad women to make items such as quilts, awnings, and camel saddle cover. 10 - Rogan Painting Crafted by the Khatris of the Kutch region, Rogan Painting captures the essence of India. 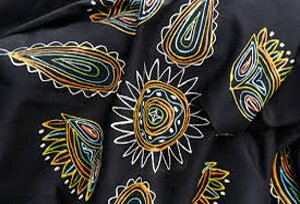 Rogan, a speciality of Niruna village, near Bhuj, is a unique technique by which cloth is decorated with an intricate, embossed and lacquer-work pattern. Rogan Painting has its origin in Iran, they made of naturally colored stones. The painting is made by boiling the color in castor for two days till it turns into a thick gooey paste. The artists take the colored paste in lumps on palm and then use a steel pencil as a brush to paint on cloth. 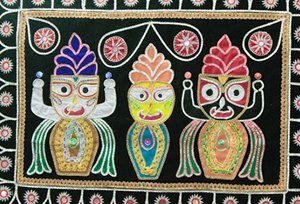 The art form is available in the form of wall hangings, tablecloth, curtains, sarees and skirt borders. 11 - Tangaliya Work Tangaliya is 700 hand woven textile craft found only in the Surendranagar region of Gujarat. 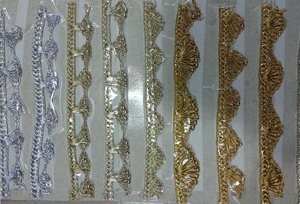 The pattern is used for preparing shawls, dupatta, dress material and products of Home décor & accessories. 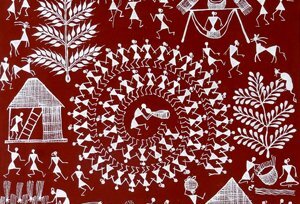 12 - Warli Painting Warli Painting is a tribal art done by the tribes nestled in the border area of Gujarat. Through these paintings, tribes express their beliefs, traditions and customs. The whims and moods of tribal life make for interesting themes, which is why Warli Paintings are much more than designs on walls they are authentic depictions of a way of life. 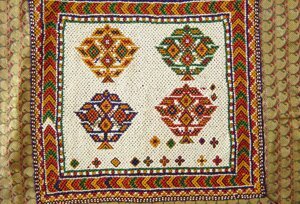 13 - Rabari Embriodery Rabari embroidery is practiced by semi-nomadic Lohana community people in Banni. The objects that Lohana community embroiders highlight significant events, rites, and values of their lives. One can see the use of Rabari embroidery in garments, wall hangings, purses, pillows and Kothalo-the dowry sacks. 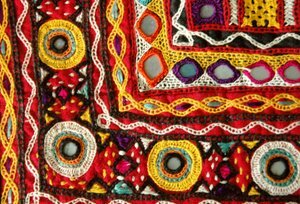 Rabari embroideries reflect the primacy of children because it is said that the mirrors which are embellished on the embroidery guards kids against evil spirits that are believed to inhabit their world. Gujarat is a treasure trove of art and craft. The state is a paradise for those who are keen on shopping traditional products like clothes, kitchen utensils, silverware, purses, wooden frames, etc. With so many handicrafts options up for grab for tourists, Gujarat is soon going to be a shopper's paradise.